Many Martian landscapes contain features that are familiar to ones we find on Earth, like river valleys, cliffs, glaciers and volcanos. However, Mars has an exotic side too, with landscapes that are alien to Earthlings. This image shows one of these exotic locales at the South Pole. The polar cap is made from carbon dioxide (dry ice), which does not occur naturally on the Earth. 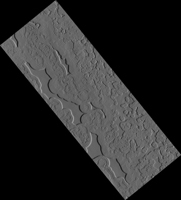 The circular pits are holes in this dry ice layer that expand by a few meters each Martian year. New dry ice is constantly being added to this landscape by freezing directly out of the carbon dioxide atmosphere or falling as snow. Freezing out the atmosphere like this limits how cold the surface can get to the frost point at -130 degrees Celsius (-200 F). Nowhere on Mars can ever get any colder this, making this this coolest landscape on Earth and Mars combined. This is a stereo pair with ESP_047237_0930.